Alessio has been passionate about the human body and it’s function since he can remember. He has enjoyed a whole range of sports from an early age in particular martial arts. After reaching a good standard in Judo, unfortunately and reluctantly, he had to stop practising due to several injuries. Since then he has been working hard to take care of his body and well being through his studies in physical exercise, its application and the use of meditation within such an environment. Overwhelmed by the results achieved through pure effort and dedication, he decided to share his experience with others and hopefully attempt to help others in similar situations both physically and mentally. He originally certified as personal trainer and Judo coach in Italy where he worked at a local gym as a general fitness instructor and also in an American Navy base as judo instructor, therefore fulfilling both of his passions. Alessio decided to move to London to expand his knowledge on anatomy and physiology, training as a holistic massage therapist and then moving onto his diploma Sports Massage Therapy level 5. He has treated a range of conditions including, but not exhaustive of, tendinopathy, piriformis syndrome, neck & shoulder and lower back pain. He is very passionate about massage therapy and the results it can achieve. 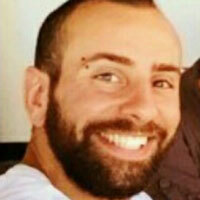 As part of his continued professional development, Alessio is studying dry needling and lymphatic drainage.